We seem to have had a few striking bikes roll through the grit.cx test centre doors recently. From stainless steel, to big clearances, to suspension in the fork steerer, bike manufacturers are all seeking ways to improve comfort over the kind of mixed terrain a drop-barred off-roader can take you. Here’s another to add to the mix. Titanium AND crazy looking suspension, all in the same package. The first iteration of the Tripster ATR was probably one of the original, modern day do-it-all drop-barred bikes. Its name (adventure, tour, race) gives the first clue to the kind of diverse riding it was designed for. 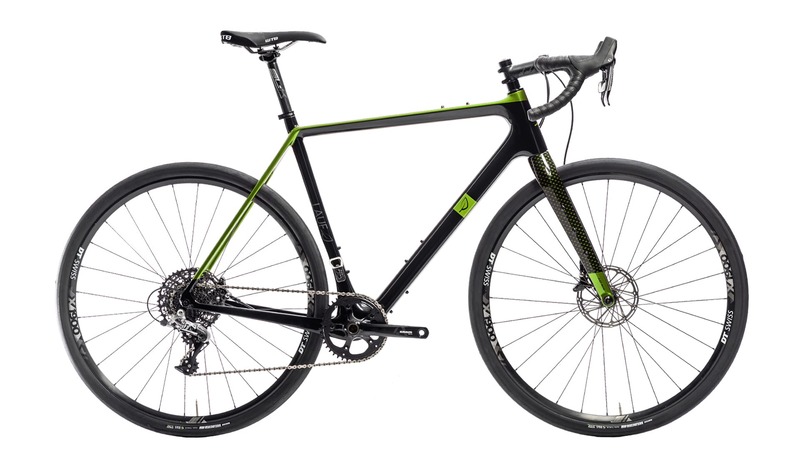 At the time, Kinesis took a deliberate step away from ‘cross race geometry, included practical features like disc brakes, and rack and guard mounts to end up at the forefront of the adventure bike trend. 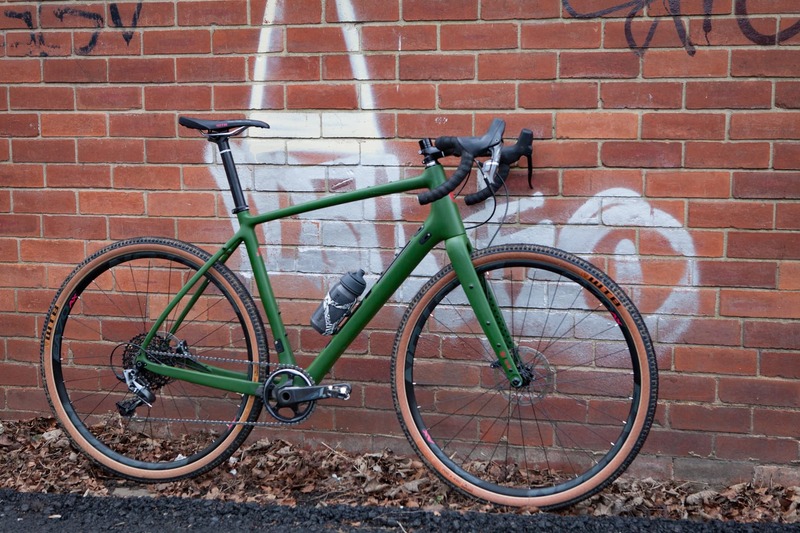 By using titanium, the company was able to create a light and lively bike – one which quickly became a forum favourite over on Singletrackworld. That original frame was released back in 2012. After four years, Kinesis felt like it was time for the ATR to get an update. It was a case of evolving the platform, rather than wholesale changes. The new frame features an increased gauge on the down tube for strength, and a flattened top tube that allows for a better fit with frame bags. Out back, there’s flat-mount rear disc brake tabs, and a switchable rear dropout system that gives owners the choice of running 12 x 142mm through axle that come as standard, or a more traditional 9x135mm for QR. The frame now also uses internal cable routing, which is also Shimano Di2 compatible, should you wish to go for a full dream-build spec. There’s clearance for up to 700x45mm tyre at the rear, and it will also run 650b wheels/tyres up to around 50mm. Somethings haven’t changed. The frame is still a beautiful looking brushed titanium (although the aluminium version, the Tripster AT is now available), features three bottle cage mounts and mounts for racks and guards. It also maintains the distinctive hour-glass shaped tapered head tube. Welded rack and ‘guard mounts, triple bottle cage mounts. 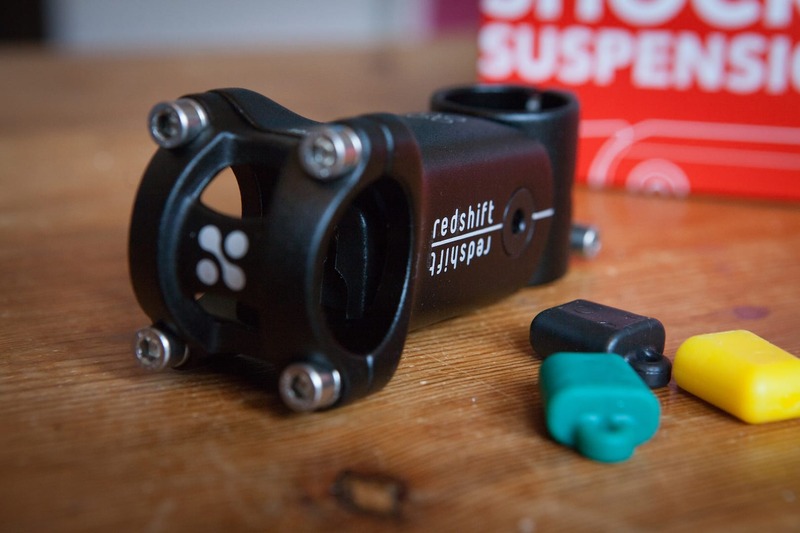 Bottom bracket: 68mm British Threaded. There is a matching full carbon Kinesis ATR disc fork available for £279.99. Kinesis distributors, Upgrade, actually also offer the full carbon TRP ‘cross fork at £419.99. You’ll already have noticed that our test bike has neither fitted, however. Upgrade has recently become the distributors of Lauf suspension forks. The Icelandic company has taken a sidewise look at suspension since 2010. Its carbon fork designs utilise glass-fibre leaf springs, rather than the telescopic legs of conventional bike suspension designs. They currently offer three forks: the ‘Trail Racer’ XC mtb fork, ‘Carbonara’ fat bike fork, and ‘Grit’ gravel fork. The company has also just started selling their own ‘True Grit’ framesets, featuring a new ‘Grit SL’ fork, which isn’t currently available aftermarket. No prizes for guess which of Lauf’s range came fitted to the ATR. The Grit is an interesting beast. The premise of all Lauf forks is that it eliminates all “moving parts”, effectively removing maintenance, improving reliability and reducing weight vs a traditional suspension fork. Made of military spec S2 glassfiber that is extremely tough on hits and flexible in the direction of the travel. The springs have been “shocked” in our test lab over 1.500.000 times reaching 22mm amplitude every time. There we go. The springs deliver 30mm of travel – not downhill mountain bike stuff, but that’s not what they are designed to do. They are intended to be extremely compliant over small lumps and bumps, as you’d expect to find on a typical gravel/trail spin. The spring rate then ramps up progressively to (hopefully) avoid some harsh top-outs. The axle to crown difference between the Lauf and the ATR fork is 15mm at rest (the ATR comes in at 398mm), 9mm when sagged and when fully compressed, the Lauf a-to-c is 385mm. What the hell does all this mean? Well, simply, the front end will be a smidge taller with a Lauf fitted when the bike is static. It will be a little slacker and bottom bracket will be marginally higher. In riding though, those geometry changes are reduced significantly. While Kinesis only offer the Tripster ATR as a frame, this bike has been built up with their seatpost, saddle and Crosslight wheelset. The groupset is SRAM Rival 1×11, married to TRP Spyre cable-actuated brakes. Our review will focus on the frame and forks, and is likely to see a few sets of wheels during the test period. Where relevant, we will, of course make note of the full build. For now, Tom has already put in some riding hours on the bike, from racing Brighton Big Dog, to hitting the local roads and trails. He’ll report back with a full review after some more hours of fun rigorous testing. If you are interested in testing either the Tripster ATR or Lauf Fork, Kinesis are available from a network of authorised dealers nationwide who have access to demo bikes from Upgrade. Lauf forks are also available to demo with the bike upon request via dealers.